I'm doing this this morning because this is what you do. I don't really know what else to do, and I've already done this, this, and this, which is basically just like what I'm about to do, so if you go read it, you'll either be really bored or catch me in an inconsistency. Ten years seems no more significant to me than one or five or seven years, so I'm not sure why the media's erect right now except for the fact that we, as a culture, find nice round numbers satisfying. Ten years ago, on a chilly Tuesday Wisconsin morning, my wife Christie woke me up with a phone call about a plane hitting one of the Twin Towers. (Christie has subsequently awakened me with news about the Columbia, and about Johnny Cash's death. I try to always be up before her now.) 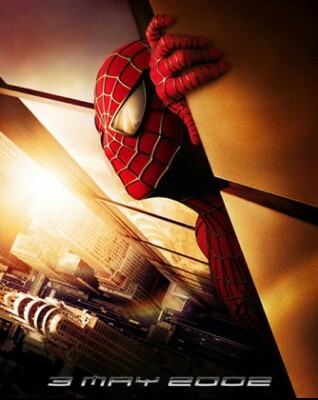 This was before everyone could tell you exactly which tower was which with a glance, and when they still had them in establishing shots in shows like Friends, or anything that happened in New York, and when the Coup was going to release this, and the Spider-Man poster had the reflection of the WTC in the eye of his mask. So she didn't tell me which tower it was because she didn't know at that moment. As I recall, I don't think she actually woke me from a sound sleep, I think she just got me out of bed, where I was soaking up morning quiet. The mood was good before that morning - four friends of ours had married recently, and Christie was really amazingly pregnant and would be giving birth soon. I recall standing on our rug - the one Max would eventually pour white paint on - and watching the coverage of the attacks. I still went to work, but I did nothing productive or of consequence all day except watch primary Big Three network coverage on my old TV with the stickers on it and rabbit ears sitting on the edge of the work table with not enough extension cord. Truth be told, that day is part of the reason I keep hanging on to that TV. We had a discussion group that night - which was supposed to be a Comics Night where adult friends of mine sat around and read comics at one another - and I eventually put an American flag out in front of our house. I was not then, and have not really ever been a nationalist, but I did feel two things: one, it was the quick, available symbol of the time, and remembrance of the dead was paramount, and also I was deeply, internally offended for the 3000 people who had the promise of what I believe America to be about - the right to live free from other people's oppressive beliefs, a promise that rarely pans out like I think it should - ripped away from them. I displayed the flag then for the same reason I hold Captain America as my favorite superhero - it's all about the idea, the promise and the responsibility. My flag came down, as did many, when we saw how it was getting exploited in a post 9/11 world. The next 17 days for me is kind of a blur - I remember getting the newspaper on the 12th and holding onto it, knowing that it would important, and doing likewise with TIME magazine and Marvel Comics' fundraiser issues. I basically bought one of those for every person I knew who I thought would want one. I remember the absolute certainty that we would end up going to war over this, no matter what, and the outpouring of support and brotherhood from the rest of the world. Yeah, remember that? I remember when TV football was insane with 9/11 stuff, and when it was inescapable. For a long time. At the end of 17 days, my world refocused completely with the birth of my son. Now, I'm looking forward to the rebuilding, which I posted a picture of at the top of this blog. I want my family to be able to go there when everything is opened up and see what there is to see when we put things back together. Destruction takes only moments. Building takes a long time, and is usually worth it. I look forward to seeing the results.